Hotels, restaurants, estate agents and tourist publications often refer to the Hope Street area as the Hope Street Quarter. In recent years it has been widely referred to also as the Cultural Quarter. There is a slight problem for historical perfectionists like ourselves since the Cultural Quarter is in fact the area around St George’s Hall, the museum and Walker. Still, let’s not be too fussy. We shall shortly be looking at the Learning Quarter, which flows down besides the RC Cathedral and into Hope Street: indeed, so intimate is the union that the pavements and roads upgrading link the two quarters. The Learning Quarter prospectus includes many images of Hope Street and the Hope Street area (mainly restaurants and fine Georgian Buildings). Yet there are other quarters superimposed upon the mainstream descriptions. These occupy the same place as the others, for instance the hugely important Imagine mental health service, three centres for drug and alcohol rehabilitation, and a very large nursing home for long-term vulnerable people. Where the ‘other end’ of Hope Street, opposite the end where the Learning Quarter is, begins the Toxteth or the Windsor Street Quarter, headed by a Merseycare hospital. Let’s not forget either that the workhouse we’ve mentioned already, the Blind School, and the orphanages, sheltering homes and alms houses (all falling within the ‘Hope Street Area’) are relatively recent history. We’ll return to look at the history of poverty, mental health and wellbeing in future posts. Below is a piece by Phil Thornton giving a somewhat sobering pause for thought. Among other things, it suggests the ways in which Hope Street in some aspects is a microcosm of the city. How many quarters can a city have? The newly proposed ‘Hope Street Quarter’ or ‘Hope Quarter’ joins other equally ridiculous quarters in Liverpool’s city centre such as the Met Quarter (a shopping mall) and the ‘Knowledge Quarter’ along with made up zones such as Ropewalks and East Village. The trend for this arbitrary zoning and re-zoning of city centres is part and parcel of the regeneration industry, transforming formerly run-down o derelict areas by giving them pseudo-cosmopolitan handles Manchester’s ‘Northern Quarter’ for example used to be the seedy, undeveloped but ‘Bohemian’ area between Oldham Street and Piccadilly station. It’s still seedy, undeveloped and ‘bohemian’ and has retained that aura of rough and ready edginess that all city centres require as an escape from the sanitized retail zones that have spread like a consumerist cancer across the rest of the city centre. Liverpool has copied Manchester’s blueprint in a desperate bid to re-market itself as a vibrant, forward-thinking 21st century haven for spenders and students, the chattering classes and the ‘business community’ anyone in fact apart from the people who actually live in the city, those who don’t fit into the marketing peoples’ vision of the future. Yet these quarters and zones have no boundaries either real or imagined; where does the Knowledge Quarter begin and end, where is East Village on the map? The development of the Hope Quarter is aimed at attracting money away from Liverpool One, and whilst the proposals speak of ‘community and ‘culture’ it is commerce, as usual, that is really fuelling this concept. the centre of commercial activity away from the traditional shopping areas moving south from the city centre from Hardman Street and Bold Street up towards the cathedrals and the bourgeois/boho area of Hope Street with its theatres and bistros and colleges. Just as the formerly thriving area around London Road has now become a wasteland of tatty material shops, cut price bargain stores and run-down alehouses, so the city centre south of say Hanover Street is quickly fading as the money gets sucked into the privatized black hole of Liverpool One. The Hope Quarter is designed as a counterweight to the short sighted easy money options that resulted in Liverpool One’s development which was itself the culmination of 30 years of constant ‘re-generation’ beginning with Albert Dock. If the city centre looks much better than it did 30 years ago and that’s a matter of opinion, then there’s no doubt it looks very different. Yet there are still many questions to be answered about how aristocrats such as Lord Grosvenor and wealthy companies such as Peel Holdings can own swathes of the city centre and enrich themselves at the expense of the ordinary people who are increasingly squeezed out of the city centre back to their red brick reservations on the periphery. For all the billions spent in Liverpool via EU objective one funds, government and private investment, what has changed for the everyday people? Walk a few miles in any direction from Liverpool One – north to Kirkdale, south to Toxteth, east to Kensington (or even west across the Mersey to Birkenhead) and suddenly the rosy future promised during the run-up to Capital of Culture seems just another mirage. Simply re-naming something doesn’t change it. Canny Farm is still Canny Farm even if the planners prefer Stockbridge Village and Duke Street is still Duke Street even if the marketing suits prefer to name it East Village. How many quarters can a city have? The Four Quarters of the Apocalypse – culture, retail, education and administration? A city and a psyche can’t be neatly divided in such a fashion and such zonings are actually counter-productive, forming ghettoes and increasing division. If we can have a Hope Quarter why not a Despair Quarter? I’d certainly spend my hours if not my money there. We shall be returning to the main Liverpool workhouse on several occasions in future posts. For now, note that it is located where the present RC Cathedral now stands. You can see the Medical Institute and Hope Hall (later Everyman Theatre) at the top of Hope Street. It remained open until 1928, housing some 5,000 people. It was virtually a small town. As well as providing a home for ‘paupers’ it also provided infirmary services for the poor. The history of workhouses is dense and goes back hundreds of years, so we will refer to sources we come across which deal with this history, and only select a few specific points on our own site. A good starting place is the brilliant workhouses.org site. The site contains details of the Liverpool workhouses including the main one shown here. Some of the workhouses became hospitals, such as at Toxteth (Sefton General) and Walton. Closely related to the workhouses, in the context of the poor and sick, was the development of industrial schools and infirmaries. For instance, at Broadgreen, facilities for epileptics and TB patients eventually became Broadgreen Hospital. There is an excellent article by Mike Royden on the development of workhouse infirmaries and how this laid the basis for the hospitals that followed. We shall be concentrating on the Brownlow Hill workhouse. Many individuals were involved here such as Florence Nightingale, Agnes Jones and William Rathbone. Their reforming work in many ways anticipated the modern welfare state. Several sites in the Hope Street area are connected with them. We have more than a thousand pictures of Hope Street taken in recent months. This one’s selected as a good example of how a picture can contain signs of so many different things. At the left is the famous Philharmonic Pub, the original location of William Hope’s house, the origins of the street’s name. 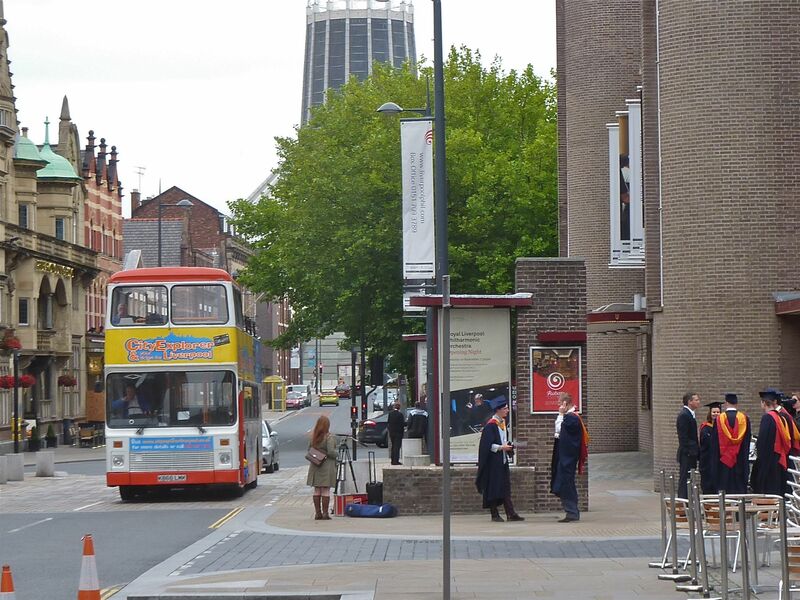 A tour bus shows the rise of tourism in Liverpool over the past decades. The Metropolitan Cathedral is one of the well known markers of the limits of the street, also a reminder of the city’s biggest workhouse on that location, and, of course, the part religion, here Catholicism, has played in Liverpool’s history. The modern road surfaces and pavements demonstrate recent regeneration of the street. The Philharmonic Hall is the world famous home of the Royal Philharmonic Orchestra and venue for all things musical – and, as we’ll see in later posts, the site of many activities and events apart from music, here, for instance being used for a graduation ceremony. Professional film and television makers are in evidence too reminding us both how many ‘notable’ individuals visit Hope Street, and how the area is a firm favourite for drama productions because of its Georgian terraces and cobbled streets. Finally, the chairs and tables at the bottom right of the picture stand for the growth of the ‘cafe culture’ along the street. Yesterday, Steve took more than 2,000 pictures along Hope Street using quick burst, several frames a second mode. These will be used for a variety of purposes in our future productions. Just one of them is shown below as a contrast to the first picture: it’s dark, wet and maybe more ‘solid’ in its depiction of the street’s deeper history? 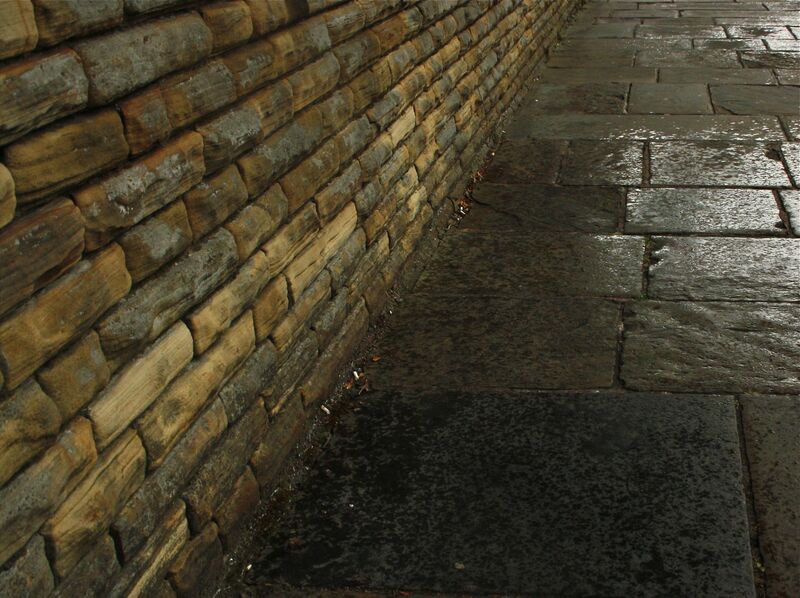 Of course, in contrast to the modernised pavements above, the older paving stones are preserved here and in the entire ‘Hope Street Quarter’ along with cobbles, Victorian lamp posts and original brickwork etc. Perhaps, in an understated sense, we can ponder on the preservation of the past seemingly merging with the new.